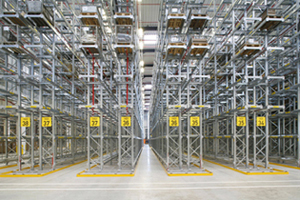 Narrow Aisle racking maximises the available storage area whilst offering easy access to all pallet locations. 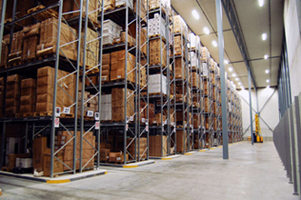 Limitations in available warehouse floor space call for space saving racking systems such as Dexion Narrow Aisle. 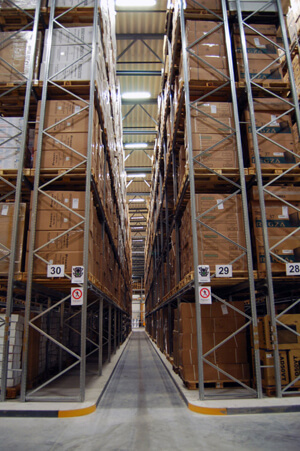 Narrow Aisle racking maximises the available storage area whilst offering easy access to all pallet locations. This blend of fast picking and efficient use of space is the main benefit of Narrow Aisle over conventional Wide Aisle racking. Dense storage systems are used in warehouse operations in a vast range of industries and Dexion Narrow Aisle owes its popularity to a high level of flexibility and adjustability in terms of the heights and depths of the racking. Dexion Narrow Aisle pallet racking enables the use of special narrow aisle lift trucks ranging from man-down high-lift to man-up order picking trucks. This racking system is great for pallet storage or fast-picking. Special Narrow Aisle trucks are required and are guided with precision using guide rails or wires, limiting the risk of rack damage often associated with forklift trucks. Narrow-aisle high-bay racks are especially suitable for maximum storage capacity and fast availability in a limited area. You can drive along the space-saving aisles with high-bay lift trucks (man down) and order-picking lift trucks (man up) for fast order picking directly from the pallet. Additional upper guide rails, if required, ensure precision and safety even at high speeds.